Stylish, Thrifty & Fabulous: It's the Thrift Stylist! — It’s Anahita! IF you don't already know....NOW you know that there are amazing women in our community such as this WONDER Woman doing impactful, creative and FUN work. Combining shopping, donating and volunteering + advising and strategizing are just a few of the hats that Michelle Raven wears! Let's get to know her! Michelle Raven is a powerhouse lady: wife to Jon, mom to toddler Sawyer, fur mom to their dog Kato, an entrepreneur and quite THE influencer. SHE is the founder and creative force behind the free personal shopping & styling service at Arc’s Value Village Thrift Stores. Michelle has been recognized as a business leader and innovator—in 2014, she was named a 40 Under 40 honoree by the Minneapolis/St. Paul Business Journal. 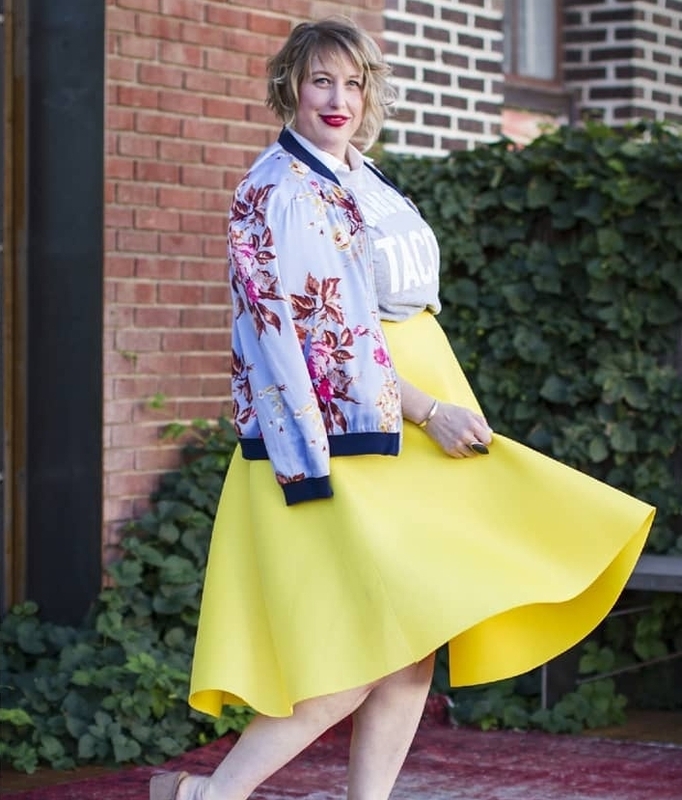 In 2017, Mpls.-St. Paul Magazine highlighted for her impact on the local style community. In addition to overseeing the thriving thrift styling program she created, Michelle focuses her time on balancing inventive ideation with tactical precision as an event planner & creative project manager for Arc’s Value Village Thrift Stores. Michelle also serves as a Senior Advisor for Fashion Week MN, a semi-annual community-driven initiative celebrating the talent of the Minnesota fashion industry and creative community. "This role has satisfied an itch of intellectual curiosity about the inner workings of a fashion driven business." What is your goal in the work that you’re doing? I’m all about growth and expansion in 2018, both personally and professionally. I’ve been really focused on broadening the scope of what I do within the creative community. I’m being very intentional about exploring how my skills and experience can translate to different projects. I’ve doubled the size of our styling team in the last six months! We’re also testing some creative new ways to mimic the success of our thriving wardrobe styling service. My goal is to keep going and keep growing. What is one of your most proud moments? For the past few weeks, I’ve prepared gourmet-style meals for my family three nights a week. I’m incredibly proud of this because just a month ago, I was convinced I couldn’t cook and I had convinced everyone around me of that too. But then one day I just thought, you know what, that’s a fallacy! And I just started trying. Turns out, I’m actually a pretty damn good cook. This shift in my thinking about CANs and CAN'Ts has reformed my approach to my work, too. How do you think women can properly support & empower one another? Where do you think there are areas to improve? I’ve made it a priority to spend more time making real face to face connections. I think we can support each other by making time for each other. An area that I’m working on improving is being really mindful of what I say about others, especially women. I’ve made a personal commitment to stop using gossip as a tool for bonding. I even asked a few of my close friends to hold me accountable. I want to talk about visions, ideas and goals, not other people. Whether we’re at an event, observing on social media, with other Mom friends… what can we do to feel confident and at peace? For me, it’s been a really intentional choice to be confident, comfortable and at peace with myself. I remind myself constantly how cunning our society is at telling women they are inadequate. I can choose not to accept that pervasive message of inadequacy and instead replace it with a different message - the message that I am valuable, worthy, capable and beautiful without having to meeting anyone else’s prerequisites. How do you disconnect from the creative/entrepreneur work? I never try to disconnect from creative or entrepreneurial thoughts. If my focus has to be elsewhere or I don’t have time to really process through an idea, I always keep a notepad at the ready and I jot things downs. That way I won’t lose the initial idea, but I can table it until I have more time to delve deeper. This community has been incredibly supportive of me. I am so grateful and humbled by that. I can only ask for more of the same, please! See?! Stylish, Thrifty and FABULOUS! Learn more about Michelle, her platforms and stay connected with her on Instagram at @thriftstylist.